Shepherd's Bush "Family Sampler" on 32 ct. Vintage Luna. LHN "Home of a Needleworker (too)" on 32 ct. Vintage Light Examplar. LHN "Heart of America" on 32 ct. Vintage Examplar (I think I'm leaning towards this one). Can't you hear them all yelling out 'pick me, pick me!'? They're all lovely Nicole, I'm even having problems deciding :) I'd love to see Home Of A Needleworker (too) stitched up. 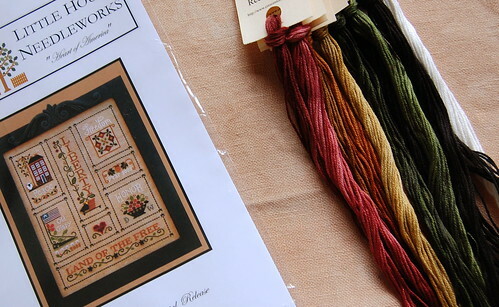 Then again Heart Of America would be interesting... and I love the colors of Family Sampler. Sorry, tough choice. Pick Heart Of America if it's calling out the most. I'd lean towards Heart of America, too. All those mini motifs would let you have mini Happy Dances. Then Home of a Needleworker. At least get that done for your new home. I pick Heart of America too. I want to get it for myself and can't right now. so if you stitch it I can enjoy your progress. I would LOVE to see you do Heart of America! I'm odd woman out! I pick Family Sampler! Why not just bring allthree on Sunday and start all three of them then?? You have some hard choices. But if it were me I would have to go with Heart of America!! I'm for the Hearts of America too, you'll have a nice new sampler for the 4th of July! 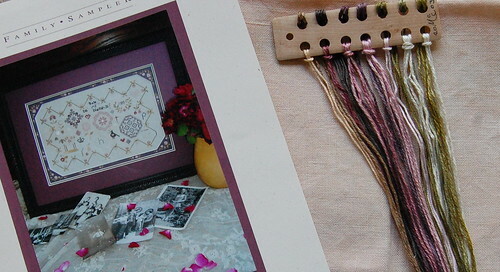 SB's Family Sampler is really pretty, but it's big so I only work on it now and then. They are all gorgeous! I'd like to see the Family Sampler Stitched - there is something about that piece that calls to me gently. course I'd have to get the kit first! Hard choices, but what about Heart of America? I say Heart of America also, as I have not seen any WIP's of it yet. 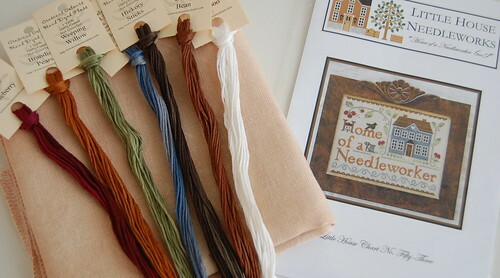 I am starting CCN's Summer Garden today and have Home of a Needleworker Too next in line. Well, if you're asking for opinions, I vote for Home of a Needleworker. But, you have to listen to what's screaming at you the loudest. LOL! I would vote for the SB family sampler, I love these colours!! I just want to kick myself when I forget my stitching. I try to keep something smallish in the car, too. You just never know !! OOh too many choices - and they are all gorgeous!